Do you remember your dreams? Sometimes I do and sometimes I don’t. Earlier this year I was going through a period when I knew that I had dreamt yet had no specific memories when I woke up. I wanted to recall my dreams again so I signed up for a dreamwork group with Trevor Simpson. The last session in the series of four was last week. Sessions were both interesting and helpful. Before they started I only recalled three or four dreams a month, but over the three months of the group I recalled over 50 dreams, and was able to explore a number of them in depth. Remembering and exploring my dreams helped me clarify ideas, and provided new perspective on decisions. It also helped me remember that the parts of ourselves we don’t have conscious access to can be amazing, creative and funny. Your dreams are gifts that you may not know how to open. In the past I kept a dream journal for several years, using Ira Progoff’s Intensive Journal Method, and the genesis of my novel-in-progress came from a vivid dream I had during a nap one afternoon in 1974, so dreams have been a powerful source of creativity and self-development for me already. Carl Jung’s work on dreams has also shaped my personal work. Dream Moods has a good overview of Jung’s theories about dreams. Active Imagination is Carl Jung’s tool for expanding dream work and creative work. This article by Lawrence Staples of the Jung Society of Washington, D. C., gives a good explanation and an example of the connection between dreams, active imagination, and creative work. The list of articles on the International Association for the Study of Dreams website shows the extent of worldwide interest in dreams and some of the research currently being done. The list includes articles on a broad list of topics from the usefulness of problem-solving dreams to dreams of the blind. Want to know more? Wikipedia has a good overview of Dreams. A young girl wakes from an afternoon nap in the dormitory above the great hall of a dancing school. She is wearing a dancer’s top and practice skirt wrinkled from sleeping. She jumps up and begins to move immediately in response to a call from the hall below. She moves from the dormitory to the balcony above the hall and is dazzled by the light flooding the hall rotunda as the sun sets. The light gives everything warmth: the floor tiles, the fountain, the lush foliage in pots round the interior of the hall, and the small group of dancers waiting to perform the traditional grace dance before the meal. The girl is suddenly filled with joyousness, with a tingling awareness of life, feeling, and the need to communicate the inexplicable. She runs down the stairs to the rotunda space where a fountain is at the centre of the circle the dancers are forming for the evening thanks dance. She doesn’t wait for the dance leader, simply steps into the circle and gives the signal for all to join hands. As the dancers join hands, she feels the circle form and the joy she feels begin to move through everyone in the circle. She has a vision of thanks for the day, gratitude that acknowledges each moment that brought the evening’s meal to them: earth, plowed, then planted, moistened by rain, warmed by sun, fronds of wheat waving gracefully, harvested and ground by the mill, brought in sacks loaded on a patient donkey to the school kitchens where it was mixed, baked, and set by the side of the fountain waiting to be blessed. The energy she felt and her connection with the dancers let the scenes she saw be seen by others, covered the dancers bodies with a vision of the journey from seed to bread, but she didn’t have either the strength or skill to maintain the vision. 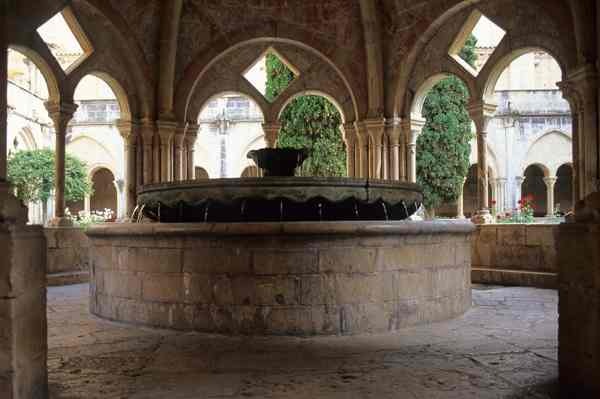 She was suddenly returned to the hall, and and sound of water from fountain, as dancers broke from the circle. She falls, crying, to the tile floor. The other students whisper, waiting to see what would happen to her. She broke the first rule for a student, that a student never leads a dance; only dance masters may lead. The dance master approaches her, lifts her gently to her feet, and tells her to pack her clothes and prepare to leave immediately. She must wait by the gate for further instructions. I am still working on unfolding the story and continue to be astonished by the amount of information packed into the dream, and the freshness of it so many years later. The novel is now 30,000 words and still growing. Join the discussion: Have dreams ever played a part in your writing? Have you tried using active imagination?